SyncBackSE is a powerful file backup and synchronisation tool which can be used with hard drives, removable media, network shares, FTP servers and more. The program enables you to set up backup or synchronization profiles. A backup profile essentially copies the source folders and their contents to the backup location. A synchronize profile changes data in both directions to ensure that source and destination locations are the same. You can set the program to work in simple or expert mode depending on whether you want an easily configured backup or if you need to use more sophisticated settings. The simple mode is fine for many situations, but if you need real control then expert mode certainly delivers. 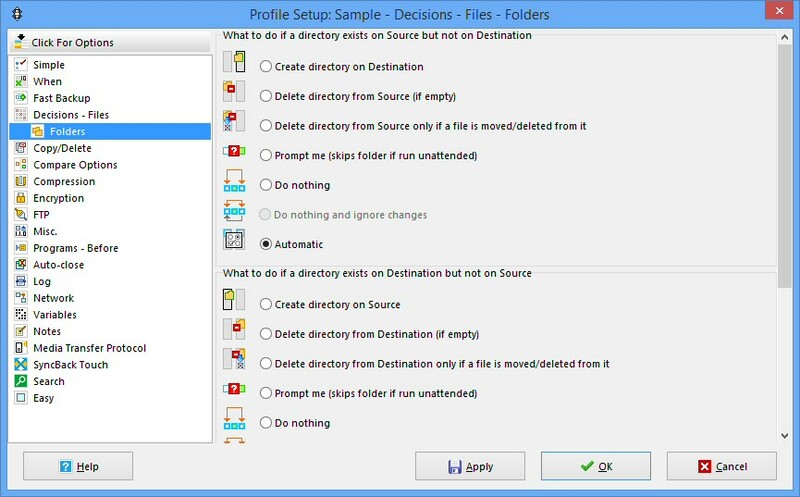 For example, once you've configured your profile, click When and you can have your job run when you press a hotkey, log in or log off, when certain files or folders are changed on the source or destination, when a particular disk is detected, when a certain application starts or stops, or at some fixed interval (or any combination of those). The trial build is fully functional and runs for 30 days. There's a good local Help file if you need assistance (and you might, there's a lot to explore), while a full knowledge base and community forum are available online. What's new in 8.6.3.0 (refer to the changelog for more info)? This is a very versatile backup and synchronising program which provides helpful guidance for setting up backups locally or to an FTP server. That also has a free version which is just perfect for simple once a day backups to an external disk. An automated tool for backing up and syncing file-based data.